We dropped off our visitors at the airport today. As pleasant a distraction it is having people around, it is, however, a distraction. But this is it, no more excuses not to get anything done. 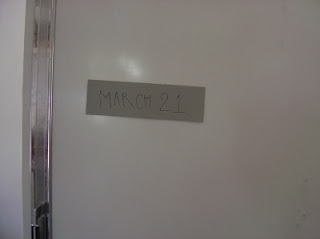 You read it right, March 21st, 2010. Actually it's on or before. If you have followed the blog for a while, you'll remember that we received our liquor license in March. A liquor license, of course, is only good if you have a working restaurant. But the liquor authority grants you the license anyway, if you open within 180 days from issuance. Well, that would be September 21st, or three weeks from today. That ain't going to happen, but we did get an extension for another 180 days, after which we would have to start anew. Guess what, we don't want to start from the beginning!!! So, this is crunch time. We still have a lot of work, but we will make it. We will have to make cuts, and focus exclusively on things that need to be done to open up. Gunk Haus won't be perfect at opening day, but it will be ready enough for the monkey wrench throwing authorities so that we can open our door officially, and invite you, my dear readers, to come by and have a cool blonde, or brown, or red, or black (you know I am talking about beer, don't you?). I still think if you can plan a day of non-skilled work, you could ask for all of us to help (and no, do not schedule it for 9 am, with our farm there is no way I could make it there by then!). Painting nonpublic areas? scraping old paint? anything else? OK -- great news about an opening date!!!! Count us in, too . . . your neighbors are happy to help (and to see new businesses come to the area). Think of it like a "barn raising" . . . pick some jobs and post some dates . . . we can do a bit at a time, individually, or work as a big group. Remember, people wouldn't offer if they didn't mean it!!! March 21st. It's SO in my calendar.